PITTSBURGH – Pittsburgh Police arrested 11 people Thursday evening during a protest supporting the LGBTQ community. Protestors gathered outside of the Allegheny County Jail in downtown Pittsburgh after reports leaked regarding the treatment of an inmate. The protestors were detained for blocking traffic, according to police. Ten of the protesters were cited, released and permitted to continue protesting on the sidewalk. One woman was taken to jail after she refused to provide identification to officers. The traffic block began on Second Avenue at approximately 5 p.m., said the city in a press release. Second Avenue is a designated Yellow Zone, according to the protest guidelines that the city published on July 27. According to this policy, traffic cannot be blocked during the morning or evening rush hour. If traffic is blocked, police will issue three warnings before taking action. “Police will issue three warnings, with the second warning coming five minutes after the first, and the third warning coming two minutes after the second,” said police in a statement. According to police, officers issued warnings at 5:16 p.m., 5:28 p.m. and 5:42 p.m. Following the third warning, officers moved in to apprehend protestors in which most returned to the sidewalk, except 11 people. 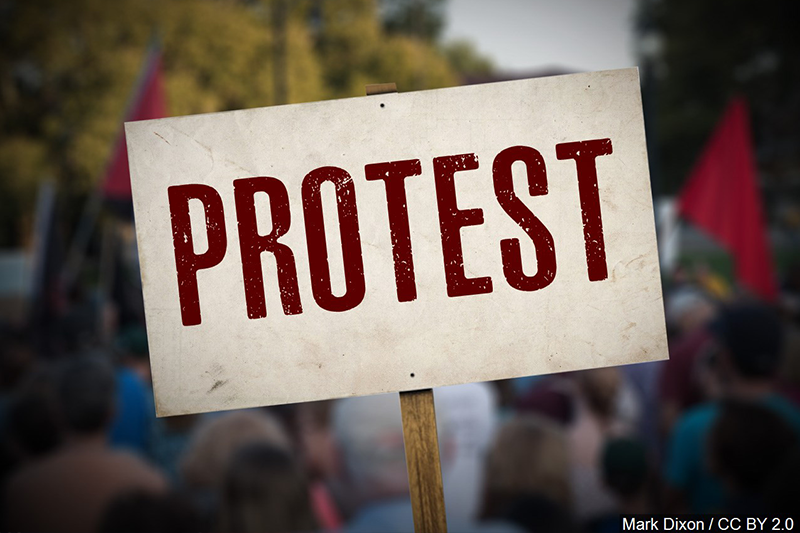 “The city remains committed to protecting the First Amendment rights of protesters while assuring that all people – from protesters to city residents and motorists who may be affected by road closures – are kept safe,” said the city in a statement to media.